Small, artisan shops have the potential to encourage more farmers to switch to pasture-based practices, and could help scale up the market for better meat. Some of these new kids on the block include The Pigheaded Butcher in Baltimore, Kensington Quarters in Philadelphia, Clove & Hoof in Oakland, and Western Daughters in Denver. High-profile chefs are also getting in on the movement, with Curtis Stone’s Gwen Butcher Shop opening this summer in Hollywood and April Bloomfield set to open White Gold in New York City soon. In the Big Apple, alone, there’s The Meat Hook, Harlem Shambles, and Fleishers, which opened its fifth location (and first in Manhattan) in August. Fleishers opened its first shop in Kingston, New York in 2004, and has been a driving force in the industry. CEO Ryan Fibiger says he’s seen his business expand as the industry has picked up speed across the board. “When you look at all of these little butcher shops that have popped up all over the country—it’s been in the past five years,” he says. Fibiger says it’s “the biggest topic we wrestle with internally,” at Fleishers, and one strategy they’ve focused on is educating consumers on cheaper cuts of meat—like brisket and ground meat—rather than prized cuts like rib-eye or boneless, skinless chicken breasts. “There’s this meat fetishizing and narcissism in which we feel like we deserve to have the greatest incarnation of meat every time we eat it, instead of prioritizing things like the farmers, accessibility, and cost,” he says. Photos provided by Gwen Butcher Shop and Fleishers. Craft? Is that code for small? There's nothing "craft" about it. Let's stop bastardizing the meaning of words. Butchering is absolutely a craft and an art. Dont belittle it if you haven't tried it. 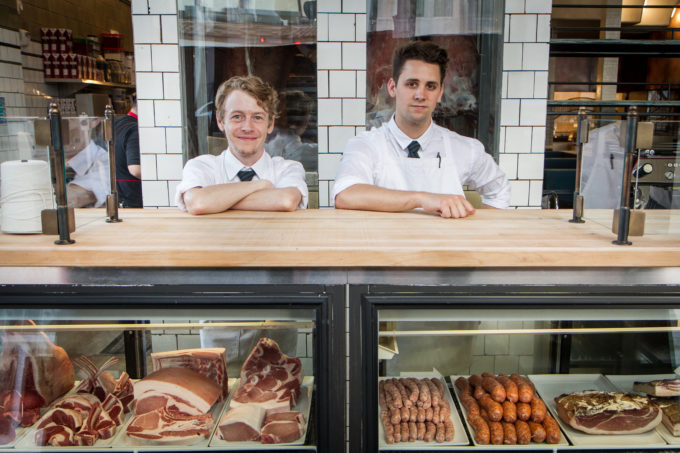 In Portland, Oregon, we're lucky to have several whole-animal butchers, including Old Salt Marketplace, where owner Ben Meyer practices whole animal butchery to supply his two restaurants and a fresh meat case, plus offering butchery classes to consumers and professionals alike. Classes are also given at Proletariat Butchery and the Portland Meat Collective, and many small pasture-raised farms offer everything from whole animals to custom cuts direct to consumers or through CSAs and at farmers' markets. Pay twice as much to eat less desirable cuts? Pay twice as much for meat from older spent dairy cows? Seriously, this is the grand plan for breaking out of the affluent elitist market? No thanks. I love eating meat and conventional meats are consistently good quality at reasonable prices. Why should I overpay for poorer quality meat just to enrich a boutique butcher and a hobby farmer? Some of you people have too much money and too little respect for ordinary people on an ordinary budget. One way to increase usage of lower cost cuts of meat is to foster knowledge of how to use these in home made pet food. I teach this and sell locally sourced meats in my store, but I have great difficulty obtaining enough of it. Yet my local Whole Foods refuses to mark it lower and prefers to throw away nutritious cuts, organs, etc that don't sell at $8.95/lb. The demand is high and growing. The distribution chain is far behind. Let's figure this out! The pet food industry is one of the most cynical, deceptive and hideous on the planet, and there are pet owners waiting for access to good, affordable meat for their little carnivores! Try visiting your smaller local grocerss. For instance, Calef's Fine Foods in Barrington, NH is a small local grocer who specializes in custom cut meat in their butcher counter. Alough they are not a whole animal butcher because their refrigerator is not _that_ big, they sell high quality meats that are more fresh than any chain grocery store around here. And their prices are comparable. So folks, you can find a local gem without it being a high priced specialized shop. Also think meat community supported agriculture and or splitting a side or portition of a steer from a local farmer with other folks . Fibiger is right. Everyone eats too much meat. It's not sustainable for a large percentage of the human race to eat as much as eat as we currently do. There's no reason why every Caesar salad has to have chicken in it, either. Everyone who eats meat should be eating the cheaper cuts, making broth with bones, etc. For the most part they are tastier than boneless, skinless, etc. parts you just need to learn how to cook them. If you want tasteless protein, just eat tofu. Fair Food is teaming up shortly with the great La Divisa butcher (Nick and his team)...why not write about them? And also Heather from Primal Meats who started as the main butcher at KQ in Philadelphia, she is fantastic!